A planning application has been submitted for a new hotel on the former Ashfield Motors site (above) in the Jewellery Quarter. A four-storey office block was approved for the land, on the corner of Caroline Street and Northwood Street, in 2008 and these plans are broadly similar. The hotel would also be four-storeys with the same overall height as the originally planned office block. You can view the detailed plans on the City Council's Planning Online tool (2009/05947/PA) and you have until 7th January to submit comments. 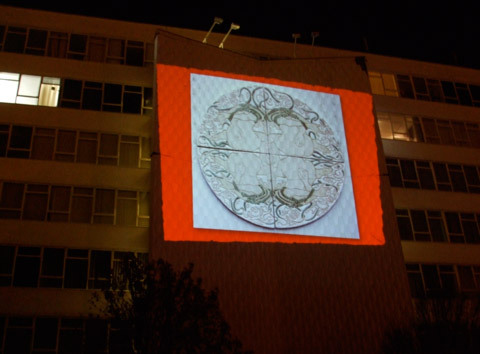 As part of Birmingham's SHOUT Festival, 30 LGBT artists from around the world saw their work projected on to The Big Peg (image above!). The Birmingham Queer Open drew entries from around the globe and selected artists represented countries as diverse as Canada, USA, Russia, Israel and Italy. The Jewellery Quarter’s farmers market, 24 Carrots, continues to do well. The Christmas special market takes place on Saturday 5th December. An invite-only stakeholder consultation day for the Jewellery Quarter’s “Golden Square” will take place on Tuesday 15th December. You can view the latest proposals for Albion Square here. The Vaults on Newhall Hill slipped into administration but it is hoped a buyer will be found. 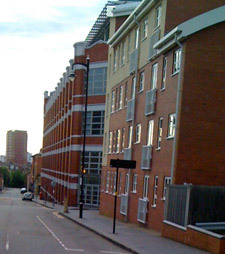 Jewellery Quarter – Slum of Tomorrow? I’m very disappointed at Conservative City Cabinet member for Housing John Lines’ comments that Jewellery Quarter apartments are the “slums of tomorrow”. I think it’s clear to all that some developers are struggling to sell all their units, while some are struggling to even finish building them. Some have apparently approached the Council hoping to do a deal to make them available to Council tenants – but Councillor Lines has said no. I strongly disagree with his view that these apartments are “not good enough for our people”. Whilst I agree they are not necessarily suitable for families, that doesn’t mean that individuals or young couples wouldn't be perfectly happy living in them. I live in the Jewellery Quarter and I am not alone in being insulted by Cllr Lines’ comments. The Jewellery Quarter has a fantastic community spirit thanks to the incredible work of the Jewellery Quarter Neighbourhood Forum and its partnership working with others including the Regeneration Partnership, JQ Association and others. Branding its potential future in this way will not help future investment or the bid for World Heritage Status at all. Of course, high quality family homes should be built across the city and I am pleased with the progress being made in that regard. But we should not ignore housing stock that is available now – and that includes apartments. In the middle of a recession we need to find sensible, good value solutions to all our problems. What we must do though, is ensure any future developments are put through a thorough planning process that scrutinises the quality alongside current demand and potential future demand - before planning permission is given for any more apartments. The detailed planning application for the new Library of Birmingham has been submitted, which kicks off a public consultation period. It would appear the controversial design concept remains, although the height has been slightly reduced after complaints it would dwarf its neighbours. Publicly accessible terraces at the third and seventh floors will provide outdoor green spaces for a range of activities, including quiet areas to read and relax with views over the city – while a ‘brown roof’ will provide a natural habitat for wildlife. Planning Online is currenlty down, having some much needed improvement work, but the plans will be available to view there in the next few days. Alternatively, you can view the plans at the Planning Office, Alpha Tower. Mechu on Summer Row has had its license restricted by the Council following a license review brought about by a resident of Islington Gates. The venue will now only be able to serve alcohol until 1am (Sun-Thurs) or 2am (Fri & Sat), with the venue able to stay open for an additional hour. The license had previously allowed Mechu to stay open until 4am. From the minutes of the meeting: "The Sub-Committee's reasons for imposing these conditions are due to concerns by local residents in relation to noise nuisance and antisocial behaviour." I wrote some time ago about the noise problems (from people and taxis) suffered by local residents. There were numerous other conditions emposed by the review, including specific taxi instructions and the fitting of a noise limiter at the premises. I'd be interested to know at what level this will be set. The owners of Mechu have 21 days to appeal. Click these links to read more about licensing and planning issues in Ladywood ward. 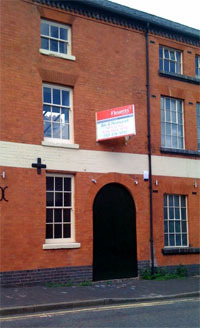 The Hockley Street premises formerly occupied by the TRMNL nightclub is now available for lease from commercial property agency Fleurets. It's interesting to note the board advertises the premises as a "bar/restaurant", not as a building suitable for a nightclub! I'll keep a close eye on what happens with this building and if any planning or licensing applications are submitted, I'll do my best to keep all local residents that were affected by TRMNL updated. The previous tenants did restore much of the inside of this building and I'm keen to see it put to good use. Any budding entrepreneurs considering opening a bar/restaurant could do a lot worse than consider this building! Most of the controversy about the planned expansion of Edgbaston Cricket Ground has related to the floodlights. Labour MP Roger Godsiff and Respect Councillor Salma Yaqoob have been particularly outspoken. "It can be a right pain living near Edgbaston cricket ground. Because the club doesn't take repsonsibility for making sure there is enough good parking for people then the people living around the ground have to bear that responsibility instead. It means gridlock and frustration - all for a gentleman's game. How odd!" Plans for the proposed Birmingham Aquatics and Leisure Centre include provision for parking within the NIA complex and proposals for a residents permit scheme on a nearby housing estate. I don't know the cricket ground area particularly well, but I assume from Nick's video that there is no such permit scheme in place. The issue with implementing one would be the alternative parking arrangements. Perhaps the solution lies in a park-and-ride scheme from say Star City, or somewhere on the 45/47 bus route? A planning application for change of use at 18-19 Caroline Street is currently open for comment. 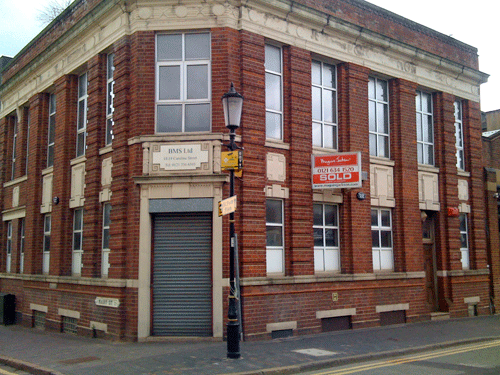 The former jewellers workshops, just 150m from St Paul’s Square, have been vacant for over two years and are in a poor state of repair. The applicant wants to set up a photography studio on the ground floor and make other units available to the creative industries. The first floor would be refurbished to allow the applicant to live above the units. Some internal structural changes have been proposed. The building occupies a prominent place on Caroline Street so I am pleased to hear the applicant would not make any external changes other than signage. There is also no parking requirement. You can view the full application including floor plans and photographs using the Planning Online tool and reference C/02412/09/FUL. Comments must be made by 1st July 2009. A matter of hours after blogging about the Live Music bill being proposed by a Lib Dem Lord, news reaches me that The Rainbow in Digbeth has been given a noise abatement order by Birmingham City Council. This is a real blow to what is a real hotbed of cultural activity - the Rainbow is far more than just a pub. The events are known nationally and the place attracts an incredible mix of international artists and local unknowns. If this really is off the back of one complaint from a resident of Abacus (which by the way is a fair distance from the Rainbow and the other side of a dual carriageway!) then someone at the Council is making an enormous mistake. As I write this, the Facebook group set up to support the venue stands a shade short of 19,000 members. As I wrote yesterday, the issue of city centre residential developments and bars/music venues isn't going to go away, but we have to be sensible about this. 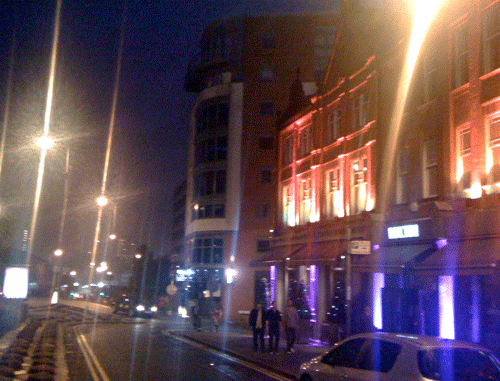 The recent closure of TRMNL in the Jewellery Quarter was unfortunate as I felt from a cultural viewpoint the venue was doing great things - but the building was unsuitable, they did not have the correct planning permission and there was a genuine disturbance caused to large numbers of residents. The Council has to take a learning point there from granting a license for unsuitable premises. There's also a learning point here. In the case of TRMNL there was a groundswell of opposition. In the case of Rainbow, you will struggle to find a single person who thinks closing the venue is the right thing to do. There is a gathering at the Rainbow at 6.30pm this Friday where the venue will be announcing their next steps. This morning I will be writing to all the Liberal Democrat councillors I know well to see what can be done to reverse this ludicrous situation.